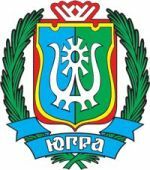 The 10th Anatoly Karpov’s tournament will take place in Poikovsky, Russia from June 3rd to 12th. Average ELO is 2695. It is 18th FIDE tournament category. ChessOK will thoroughly analyze each game with Rybka 3 Aquarium commentary. 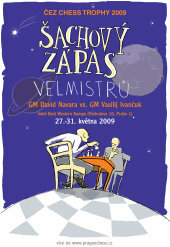 Rapid chess match between the best czech chess player David Navarra (2654) and Vassily Ivanchuk (Ukraine, 2746) will take part from May 27th to 31st in Prague , Czech Republic . Time control: 25 min+10 sec/move. ChessOK will thoroughly analyze each game with Rybka 3 Aquarium. The 17th World Computer Chess Championship takes part in Pamplona, Spain from May 11th to 18th. Participants are: Rybka 3 (last 2 years champion), Hiarcs, Junior, Shredder, Jonny, Deep Sjeng, The Baron, Joker, Equinox, Pandix 2009. Mtel Masters 2009: Shirov wins! The 5th traditional TOP GM’s tournament “Mtel Masters” will take part in Sofia, Bulgaria from May 13th to 23rd. Average ELO is 2755. It is 21st FIDE tournament category. Tournament format: Double round robin. Prize fond is 300,000 euro. The traditional tournament of Bosna chess club will take part in Saraevo, Bosnia and Herzegovina from May 7th to 18th. Average ELO is 2690. It is 19th FIDE tournament category. ChessOK will analyze all games of this tournament with Rybka 3 Aquarium. 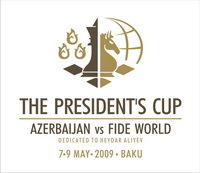 Rapid Chess match between Azerbaijan team and team of FIDE World will take place in Baku, Azerbaijan from May 7th to 9th. Members of Azerbaijan team: Teimour Radjabov (2756), Vugar Gashimov (2730), Shakhriyar Mamedyarov (2725), Gadir Guseinov (2659) and Rauf Mamedov (2645, reserve player). Members of FIDE World team: World Champion Viswanathan Anand (2783, IND), Vladimir Kramnik (2759, RUS), Alexei Shirov (2745. ESP) and Sergey Karjakin (2721, UKR). Time control: 25 minutes per game. The final score: 10½ - 21½ for FIDE World team.